A pest that can infect plants from lavender to cherry trees is of real and growing concern in the UK, say experts. Outbreaks of Xylella fastidiosa have caused widespread problems in Europe, wiping out entire olive groves. The Royal Horticultural Society says the disease could arrive in the UK on imported stock, threatening gardens. The European Commission has stepped up protections against the spread of Xylella, which can infect more than 350 different plants. But RHS head of plant health Gerard Clover warned that it was probably only a matter of time before it spreads to the UK. "Xylella is a game-changer for gardeners and the horticultural industry and it is vital that we understand its potential impact," he said. 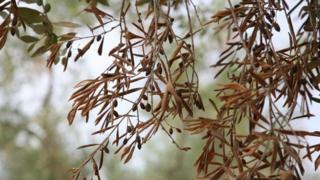 Experts describe Xylella fastidiosa as one of the "most dangerous pathogens worldwide". The bacterium invades the vessels that a plant uses to transport water, causing it to display symptoms such as scorching and wilting of its foliage, eventually followed by the death of the plant. Strict emergency measures are in place in the EU after outbreaks in Italy, France (Corsica and mainland France), Germany and Spain (the islands of Mallorca, Menorca, Ibiza and mainland Spain). The UK's Environment Department (Defra) said that the threat from diseases such as Xylella are of "very real and growing concern". "That is why this year we have pressed hard at EU level for increased protections against Xylella, in order to prevent the devastating disease reaching our shores, and these were approved in October and came into force this month," said a spokesperson. "When we leave the EU we will also have an opportunity to examine all our national biosecurity measures on plant imports to ensure they are as robust as possible to protect the UK against diseases like Xylella." Defra says the disease could have huge implications for the UK horticultural trade and the wider environment. An outbreak in the UK could lead to the destruction of host plants within 100m, and a 5km movement ban for certain plants for five years. The range of plant species found to be infected within the EU is likely to increase and already includes trees, shrubs and herbaceous plants. Developing a central list of RHS-approved suppliers that meet specified plant health criteria. The RHS is calling on gardeners and the industry to future proof gardens by buying host plants that are propagated from seed in the UK or grown in the UK for a minimum of 12 months.